CALGARY, AB – Big Rock Brewery has announced details of the latest release in its program of spontaneously fermented beers produced using a custom built 2,000-litre koelschip (or “coolship”) installed in an isolated wing of its Calgary brewery. Framboise is a lambic style specialty that blends raspberries with a remarkable base beer born of our custom built Koelschip and aged in wine barrels. This arduous process takes time but creates complexity you can curl up under: sour and sweet; fresh and fermented; tangy and pleasing. Raspberry elevates wild yeast funk and the sour power propels this lambic style freight train right through your skull. Its ruby red colour and raspberry nose will please all your senses. 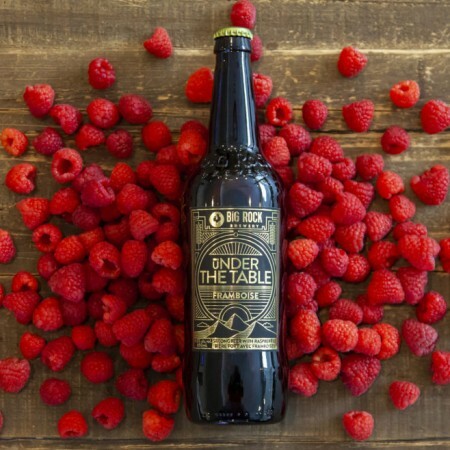 Under The Table Framboise will be released on Saturday March 9th at 10:00 AM in an edition of 1000 hand-numbered 650 ml bottles available exclusively at the Big Rock Brewery in Calgary. Bottles of Framboise will be available to purchase for $18.95 on a first-come-first-served basis, and the day will also feature behind-the-scenes tours of the brewery, and special pricing on other beers and ciders in the retail store. For more details, see the full announcement.